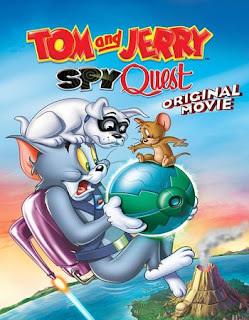 Tom & Jerry: Spy Quest 2015 | FunToMovies 300 Movies '+g+"
Story:-Two groups of classic cartoon characters come together in this fun-filled crossover with the popular action-adventure animated series Jonny Quest. Fans of all ages won’t want to miss this heart-stopping adventure as tussling twosome Tom and Jerry join Jonny Quest and his pal Hadji and embark on a dangerous spy mission in order to save the world. It’s just another day at the beach for the dueling Tom and Jerry … until they bump into world-class junior spies Jonny Quest and Hadji and their canine companion, Bandit.